Old Town Paso Robles (El Paso de Robles ‘The Pass of the Oaks’) is located about half way between San Francisco and Los Angeles on Highway 101. “Paso”, as it is commonly called, was a Mexican Land Grant purchased by James Blackburn and Daniel Blackburn in 1857. Later they donated two city blocks to be used exclusively by the City for a Town Park. If the City ever used it for any other purpose the land would revert back to the Blackburns. The Salnian Indians were in the area thousands of years before the mission era began. They called the area Hot Springs. Paso became a rest stop for travelers along the El Camino Real, in fact, a priest from the San Miguel Mission was the first to construct mineral baths for those travelers. Soon after the mineral baths were built the area began to have ranches, farms and eventually vineyards. 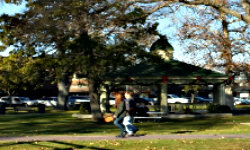 The essence of the Town Square Park (or the City Park) is the central location and the stuff in the park. The gazebo is great for sitting to while away the day or more important to gather around with friends to hear spring/summer concerts. This is THE place to be when in Paso Robles. Lots of things happen here year ’round. Get some food from one of the many restaurants surrounding the park and enjoy it in the park. In the spring Paso has their BIG WINE FESTIVAL in the park. From the Author: When I was much younger and a member of the Jaycees I came to Paso for the Paso Robles Jaycees' Annual Ron Hamilton Memorial Golf Tournament. A lot of us would gather at the park the day before for some fun and frolic. Lucinda and I have attended several of the Wine Festivals here in the park. We have friends that live on the edge of town so when we visit them we also meander around the park. The park is now surrounded by tasting rooms so you can stumble from room to room and still be safe from traffic or DUIs. If you have a group and know ahead of time you can reserve the BBQ adjacent to the play ground and the Historic Court House. Enjoy your stroll through the green grass and sit for a spell with your lunch.